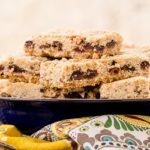 Oatmeal Date Bars are sweet, crumbly treats with chewy dates and crunchy pecans. They are a great snack and terrific crumbled over ice cream. Preheat oven to 350°F. Lightly grease a 9-inch square baking dish. Line bottom and up two sides of baking dish with parchment paper. Lightly grease parchment paper. Place dates, flour, and brown sugar in a small bowl. Toss to coat dates with flour and brown sugar. Cream butter in a large bowl. Gradually add brown sugar, beating well. Whisk together flour, oats, pecans, baking powder, and salt. Add to creamed mixture and beat to combine. Mixture will be crumbly. Press half of the oat mixture evenly into the baking dish. Top evenly with date mixture. Press remaining half of oats mixture over dates. Bake for 35 minutes. Cool completely in baking dish. Remove from pan and cut into bars, approximately 1 1/4 X 3 inches. Bars will crumble on the edges when cutting. Save those crumbles! They are a great ice cream topping.